Inter-Korea Economic Cooperation after the Moon-Kim Summit in Pyongyang — Choson Exchange - Visit North Korea & Support Local Entrepreneurs! For South Korea, this is a culmination of President Moon Jae-In’s strategy of economic engagement with North Korea. South Korea believes North Korea’s economic integration not only with South Korea but the regional economy makes Pyongyang more amenable to cooperation rather than provocation. For North Korea, this appears to be an affirmation of Supreme Leader Kim Jong Un’s commitment to economic development. In 2014, the Korean Central News Agency (KCNA) announced plans for 13 Special Economic Zones (SEZ) to be developed in the country - a policy area we have conducted multiple workshops on; In April 2018, Kim Jong Un formally asserted a new policy that deviated from a dual-track military/economy focus (“Byunjin”) to one solely focused on economic development and on an increased standard of living; On 17th May 2018, a North Korean delegation visited Zhongguancun, or China’s Silicon Valley, and was further tasked with “studying China's model of economic development”. Choson Exchange has been conducting policy and entrepreneurship workshops for over a decade, and while the highly public signalling of this new focus and the external messaging it sends to South Korean and American policymakers are new, the interest in economic development was evident from our programs. Furthermore, the South Korean business delegation traveling with President Moon Jae-In are likely to have their own thoughts on areas they would like to be involved with in North Korea. At the United Nations Economic and Social Commission for Asia and the Pacific (UNESCAP) Ad-Hoc Expert Group Meeting on Facilitation of International Railway Transport held in Bangkok, Thailand on 12th March 2015, director of the Korean Rail Network Authority and acting-Vice President of the Korean Railway Association Ko Chang-Nam gave a presentation titled “Present Status of Trans-Korean Railways and plan for connection with Trans-Siberian Railway”. 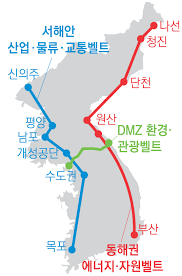 In the presentation, it is indicated that the Trans-Korean Railway project will commence in 3 phases: the 1st phase emphasises re-connection of railways in the North and South, and in order to do so, profits generated from the operation of transportation services will be reinvested into “minimum maintenance” of North Korean railway infrastructure; the 2nd phase calls for the expansion of transportation businesses and seeking the support of an international consortium to aid in modernising railway infrastructure in North Korea; the final phase will connect North Korean railways with existing networks in Eurasia. South Korean President Moon Jae-In’s blueprint for Inter-Korean economic integration highlights the Donghae line along the east coast as a potential energy and natural resources economic belt; the Gyeongui Line along the west coast has been slated to become an industrial region specialised in transportation and logistics. Should trans-Korean railway integration succeed, the Gyeongui Line will link Seoul to Pyongyang and the North Korean border town of Sinuiju, which sits close to the Chinese-North Korean border, while the Donghae line will link Pusan to multiple North Korean cities such as Hamheung, Kimchaek, Chongjin. The completion of trans-Korean railway projects will also connect South Korea with more extensive rail networks across Eurasia such as the Trans-China Railway (TCR), the Trans-Manchurian Railway (TMR), Trans-Mongolian Railway (TMGR) and the Trans-Siberian Railway (TSR). A railway transport network of this scale will render overland transport cheaper and faster relative to marine transport — cargo can be delivered by rail from Europe to Asia within 17 to 20 days, compared to 35 to 40 days by sea — and observers expect an increase in rail freight. Areas connected to this vast network of railways can generate profits from collecting transit fees, and the ease of transport, coupled with significant trade volume, also incentivises investment in these locations. A trans-Korean railway stands to benefit from existing Russian - North Korean railway development projects such as the Rajin - Khasan rail project, which supports Korean - Russian energy cooperation and joint resource exploration. Additionally, a trans-Korean railway can also serve as an “eastern extension” of China’s Belt-Road Initiative (BRI), and gain from trade, investment and potential technological transfer as China seeks to develop cross-border traffic and logistics services and facilities. Moreover, observers have also noted that the 3 northeastern Chinese provinces -- Liaoning, Jilin and Heilongjiang -- and the Russian city of Vladivostok comprise a consumer market of nearly 120 million, and these areas can further benefit from the gradual construction of overland or maritime transportation and logistics networks that augment and support the railway. However, on 30th August 2018, the United Nations Command denied Seoul permission to conduct a joint field study for a rail-link project. The study had intended to send a locomotive with six passenger cars on the Gyeongui Line as a test run. On 13th July 2018, Kim Jin Hyang, chairman of the Kaesong Industrial District Foundation, remarked, “The Kaesong complex was not a special favor to the North. It was intended to support the South Korean economy stuck in a low-growth trap”. In the aftermath of the Asian Financial Crisis of 1997 to 1998, many South Korean small-medium enterprises (SMEs) found themselves on the verge of bankruptcy; by providing cheap North Korean labour, the Kaesong Industrial Complex offered an expedient solution for these firms. As South Korea continues to grapple with the dual problems of low domestic consumption and declining manufacturing output, the Kaesong Industrial Complex, which housed nearly 123 South Korean firms, acts as an economic lifeline for the South Korean economy. For North Korea, the Kaesong Industrial Complex has generated some 53 000 jobs, and serves as an important source of foreign exchange. Between January to July 2015, cross-border trade reached 1.53 billion USD; current estimates value annual cross-border trade generated by the Kaesong Industrial Complex to be 2 billion USD. Mt. Kumgang Tourism Resort was also a source of business and employment opportunities until its closure in 2008. It was estimated that since the start of cross-border tourism in September 2003, the number of visitors to the Mt. Kumgang Tourism Resort exceeded 1 million by June 2005. The re-opening of the resort will generate significant tourism revenue and generate employment across multiple job sectors, as well as opportunities for investment particularly given the resort’s current dilapidated state. As North Korea prioritizes development on its West Coast in the Wonsan-Kalma area, reopening Kumgang will support the government’s focus on regionalizing economic development. Additionally, South Korea’s Ministry of Culture, Sports and Tourism, the Korea Tourism Organisation (KTO) and 13 local authorities have launched a joint venture aimed at transforming areas near the DMZ into “symbolic places of peace and unification”. The KTO has also launched an independent organisation in August, which aims to find ways to harmonise cross-border tourism resources. The joint venture will tap on the “ecological, historical and cultural resources” of areas near the DMZ and create the world’s first “peace tourism” site; It is expected that the project will also serve as a new engine of growth for regional economies, and already the South Korean government plans to invest in the project: 11 billion won has been allocated to creating a “peace belt” along the border, and the Ministry of Culture, Sports and Tourism plans to spend another 1.2 billion on peace tourism projects such as creating tours and pedestrian/ cycling paths that run along the border. At present, there is a lack of specific detail as to what exactly the peace tourism hub will entail. Critics have cautioned against the lack of diverse tourist attractions, which threaten the sustainability of the project. Moreover, plans to transform the DMZ into a peace tourism hub were only discussed as recently as the May Summit, which makes it hard for us to evaluate how North Korea is reacting to the idea and whether there will be significant progress on this issue.